We reported last Sunday on Saturday’s demonstration in Brussels against the Ground Zero mosque. The event, which was organized by Vlaams Belang (the Flemish nationalist party in Belgium), was banned by Mayor Freddy Thielemans, but went ahead anyway. The 2,750 fatalities in New York (the people in the Twin Towers, the passengers on the planes and the more than 400 firemen and police officers). The 184 victims of the attack on the Pentagon. The 40 victims of United 93. I would like to thank you for attending this protest demonstration against the building of an Islamic centre with a mosque near Ground Zero, the place where on 11 September 2001 almost 3,000 people lost their lives after the largest Islamic terror attack ever. The American President Barack Obama — or should I say Barack Hussein Obama? — defended the construction of this mega-mosque. Obama said that “Ground Zero is indeed sacred ground”, but he affirmed “freedom of religion” as an essential American value. I do not oppose freedom of religion. But this form of freedom of religion gives everyone the right to build any kind of religious construction wherever they want. a Shinto shrine in remembrance of the Japanese WW II victims were to be built near Pearl Harbor. a Serbian orthodox church were to be constructed near the mass graves in Srebrenica, Bosnia. What would the Islamic world say if a church were to be built near the Kaaba in Mecca? What’s more, the city of Mecca is forbidden ground for non-Muslims. The hypocrisy in the Islamic world about the mosque near Ground Zero is appalling. The Muslim community has no right to speak of open-mindedness, tolerance and freedom of religion. In countries as Iran, Indonesia, and Sudan, Christian and other religious minorities are being sentenced and even murdered. In Saudi Arabia, Iran, Mauritania, Sudan, and Malaysia, conversions to religions other than Islam are punished with the death penalty. In Bahrain, Kuwait, Jordan, Oman, Qatar, Yemen, and Egypt, someone who converts to Christianity can be given severe sentences, such as the nullification of marriage, the annulment of citizenship, the confiscation of identity documents, and the loss of economic and social rights. In countries such as Algeria, Saudi Arabia, or the Maldives, even possessing a Bible or wearing a cross is punishable. The Muslim world has to stop giving the West lessons in democracy and freedom of speech! Islam’s green fascism contradicts every form of freedom of assembly, freedom of the press, freedom of speech and freedom of religion. The construction of a mosque near the place where thousands of people were killed in the name of Islam, is simply unacceptable. It is a slap in the face of all the victims of the 9/11 attacks and their surviving relatives. Let there be no doubt whatsoever. The building of a mosque near Ground Zero is nothing less than a provocation that shows how much the power of Islam has increased, to the extent that it is even capable of building a gigantic Islamic centre near the sacred ground of 9/11. The imam behind this mega mosque, Faisal Abdul Rauf, is supposed to be an example of moderate Islam, which strives for peace with Christians and Jews. However, more and more evidence shows that Imam Rauf does not aspire at all to peaceful coexistence, but the extension of Islam’s power. In Arabic books and articles, he cracks down on governments that do not abide by Islamic law and pleads for the introduction of the Sharia. A few days ago, Imam Rauf said on CNN that “giving up the construction plans would be regarded in the Islamic world as a defeat of Islam”, which would lead to an “increased terror threat” against America. In other words: give us what we want or there will be new attacks. What a nerve! Furthermore, to this day it is still not known who finances the Islamic centre, which will cost about €100 million. Opinion polls show that two out of three Americans are opposed to the construction of a mosque near Ground Zero. The American people clearly possess more common sense than their President Barack Hussein Obama. Today, there is a protest demonstration in New York as well, where among others Geert Wilders will address the public. Not only in New York and Brussels, but in other cities as well, demonstrations are being held. All these people know why they raise their voices. The Ground Zero mosque is not an isolated fact, but symbolizes the increasing arrogance and hunger for expansion of Islam in the West. In the part of the world that is controlled by Islam, however, the most fundamental human rights are not respected, such as freedom of religion. In addition, Islam becomes more and more demanding in the West, for example with regard to the Islamic halal food prescriptions and the increasing presence of headscarves, veils, niqabs, and burqas in our streets. I would like to say that I do not agree with the pastor who wants to hold a Koran-burning. We should not burn the Koran. Everyone should read that book! Than they will realize that the Koran preaches hate and violence towards every non-Muslim. The Koran is a license to kill. It is the source of inspiration for the 9/11 attacks and the manual for Muslim terrorists and fundamentalists around the globe. Today, the American ambassador who was appointed by Barack Hussein Obama does not want to receive our delegation of Senators and Flemish, federal and European Members of Parliament. The embassy is officially closed. The American ambassador has no time for the allies of the USA, but President Obama does make time for the USA’s enemies. He recently organized an Iftar halal meal in the White House for Ramadan. Furthermore, the American ambassador organized a similar meal in Brussels as well, on September 2nd. We do not want a Ground Zero mosque! The West has to remain Western and cannot be sacrificed to Islam. The American President Barack Hussein Obama has still not realized that Islam is a threat to the West and that concessions to Islam are quickly followed by new demands. By supporting the building of a mosque near Ground Zero, Obama shows that he is a collaborator with radical Islam. Enough is enough! With this demonstration, we make clear that we do not want a mega-mosque near Ground Zero. 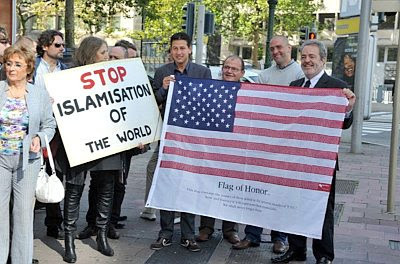 Stop concessions to Islam! Stop Islamization! No Ground Zero mosque! Hear! Hear! As one who attended the New York City rally on Sept. 11, I appreciate Filip DeWinter's statement of solidarity. I guess this means that I can go to Washington DC, organize a rally, and then speak at it against the foolish policies of the Belgian government in allowing a fascist party like Vlaams Belang (yes, I said "fascist," because according to this article, all of Vlaams Belangs movement away from defense of World War II Flemish Nazis and Mussolini-like corporatist economics "have nothing to do with content, and everything to do with tactic" (direct quote from Filip De Winter)) to continue to peddle its poison in Belgium. But, you say, how dare an ignorant American like myself, who knows appallingly little about Belgian politics, organize and speak at such a rally? Well, I ask the same question Mr. DeWinter and his cheerleaders like Gates of Vienna.